"Why is America so Fat?" 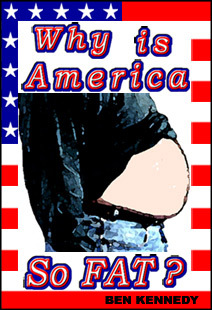 is the qustion that everyone is asking as more and more Americans become overweight. The answer, as given by author Ben Kennedy, will shock you into realizing that greed and politics play a much greater role in weight loss than do improper diet and lack of exercise. This book is an absolute must read for anyone that seeks to lose weight. © 2004 by RLK Press Inc.
Price: $ 24.99 $19.99 ON SALE! THE BOOK to read before reading any other diet or exercise book or before starting a diet or exercise program for weight loss. Why Diets and Exercise programs fail to help people lose weight. Which prescription drugs cause WEIGHT GAIN as a side effect. The real reason that Ephedra weight-loss products were banned. Who profits the most from obesity. Where to find products that still contain Ephedra you can purchase. WHAT YOU REALLY NEED TO KNOW TO LOSE WEIGHT! Excerpt from Chapter 1 of Why is America So FAT? Google Books Preview for Why Is America So FAT? Ben D. Kennedy is the Poet Laureate of PoliticalPoet.com, where he has written extensively about life in America through his beautiful poems like: A Place Known as America, Duty Honor Country, and Rebel Yell! Ben is also the author of Maid Of Heaven: The Story of Saint Joan of Arc a best selling biography about Joan of Arc. Weight Loss Tip of The Day! Need Help with Weight Loss ?